Girls Disney Cinderella Diamond Tiara necklace with .16ct round brilliant diamonds on an adjustable 16″ chain, 14kt white gold. Our Children’s Jewelry from the Disney Precious Collections has been a real feather in our cap. We’re one of the few licensed retailers chosen to sell this fine children’s jewelry. But more than that, we really admire its craftsmanship. Take a look at this piece above. Real diamonds (or moissanite, if you so choose) stud a simply designed crown. The necklace is white gold, delicate looking but sturdily made. 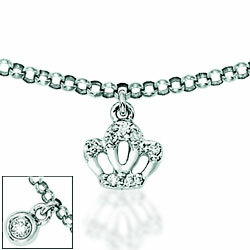 We also have chains in other materials such as silver or gold. If you need a special gift for a little angel in your life, we stand behind these pieces 100%. Whether it’s an upcoming birthday or other celebration, these pieces are meant to dazzle and delight! Disney Precious Collections, the fine-jewelry line for children, will be featured in a new exhibition featuring 600 original artworks instrumental in the development of some of Disney’s most beloved animated features. The exhibition, “Dreams Come True: Art of the Classic Fairy Tales from the Walt Disney Studios,” will open at the New Orleans Museum of Art on Nov. 15 and will run through March 14, 2010. The showcase of artworks from films such as Snow White and the Seven Dwarves, Cinderella, Sleeping Beauty and The Little Mermaid, among others, will coincide with the premiere of Disney’s newest animated feature film: The Princess and the Frog. To commemorate the release and exhibit, Disney Precious Collections has produced a limited-edition pendant featuring a three-pointed princess crown. Crafted in 14-karat gold and accented with fine gemstones, the keepsake pendant will be available only at the New Orleans Museum of Art and via select Disney Precious Collections retailers. In addition to viewing pieces from the Disney Precious Collections, which is composed of two lines: “The Enchanting Gemstones” collection of 14-karat gold with diamonds and precious gems, as well as “The Enduring Enamels” collection of handcrafted 14-karat gold and brightly painted enamel designs, visitors will have a chance to peruse a children’s section celebrating Disney’s connections with jazz music and New Orleans. Visitors viewing the artworks, on loan from the Walt Disney Studio Animation Research Library, will find that they are accompanied by film clips helping to demonstrate how individual sketches and paintings lead to a finished animated masterpiece. “We are thrilled to be a part of this unique event and believe strongly in the importance of what Disney has represented to children throughout the years, especially little girls, the true inspiration for the Disney Precious Collections,” Jack Gindi, marketing director of Disney Precious Collections, said in a media release. For more on Disney Precious Collections, check out our page dedicated to these special pieces. We’re one of the few retailers offering this limited collection. This holiday, give a piece guaranteed to please any young princess. For more on the Dreams Come True exhibition, visit the New Orleans Museum of Art’s Web site, Noma.org/dreams. Joseph Schubach Jewelers is proud to highlight this very limited line of Disney Precious Collections created fine jewelry, handcrafted in solid 14kt gold with genuine gemstones and diamonds, designed to make the young princess in your life feel inspired, special and loved. Every girl has her favorite Disney character that inspires and delights her. These pieces allow her to be close to her favorite character, whether it’s Belle, Ariel or Cinderella, all the time. There are only 3 online web retailers offering this handcrafted Disney jewelry, so check out our new Disney Precious Collection online now – prices starting at $70! 1. The Enchanting Gemstones Collection features 14kt gold, diamonds and precious gems. Each piece, such as Cinderella’s Glass slipper or Snow White’s Poison Apple, is meticulously designed to capture the magic of Disney. We feel very honored to present to you this fine jewelry for children. 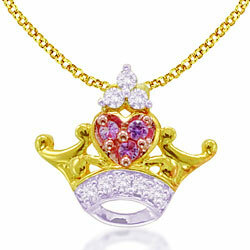 Check out our Gallery and find the perfect piece for your precious princess.